Late last month, I reviewed Superman #137 here because it was an issue stuffed with homages and references to some comics history. 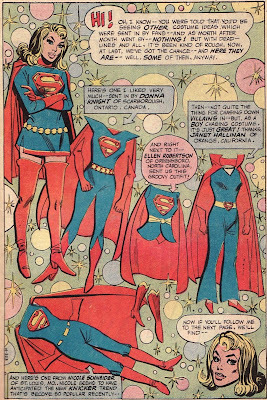 Included in that was a future 'Supergirl' sporting a mod costume straight out of the Mike Sekowsky Adventure Comics run. 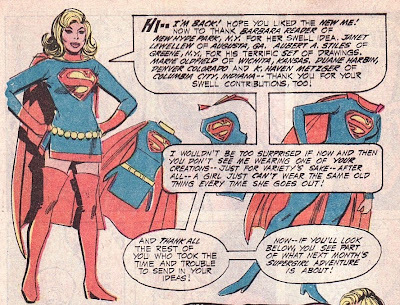 With that floating around my mind as well as the ongoing discussion around the DCnU Supergirl's new costume and blog friend Saranga (of the great Pai blog) rereading the Adventure run, I thought I would take another look back at those 1970's variant comics, specifically some pages acknowledging Supergirl fans and their submitted versions. 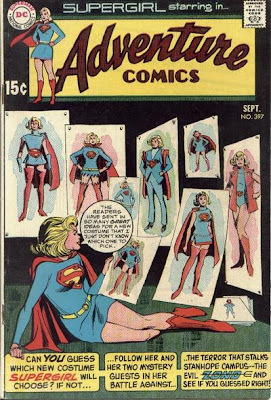 It all started in Adventure Comics #387, sporting this classic cover of Supergirl mulling over which new costume she should wear. It is a fun story I should review in total some day. In the issue, Kara heads to Diana Prince's fashion store and gets some help. The ultimate costume she chooses is the one sported in Superman #137. That costume was designed by fan Barbara Reader and sent in. 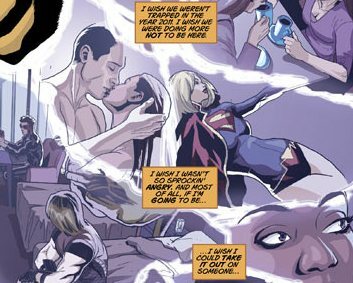 The next month was something of a transition month for Supergirl. Adventure Comics #398 had 2 stories, one in which she sported the classic Silver Age blue dress (as seen on the cover) and a second in the new costume. In between, there were some page where Supergirl showcases some of the other costumes sent in. 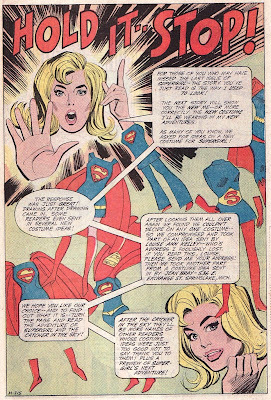 I like the 'talking to the reader' moment here as Supergirl says 'Hold It ... Stop! ', a way to jarringly let the reader now that things are going to be new, including an array of costumes. 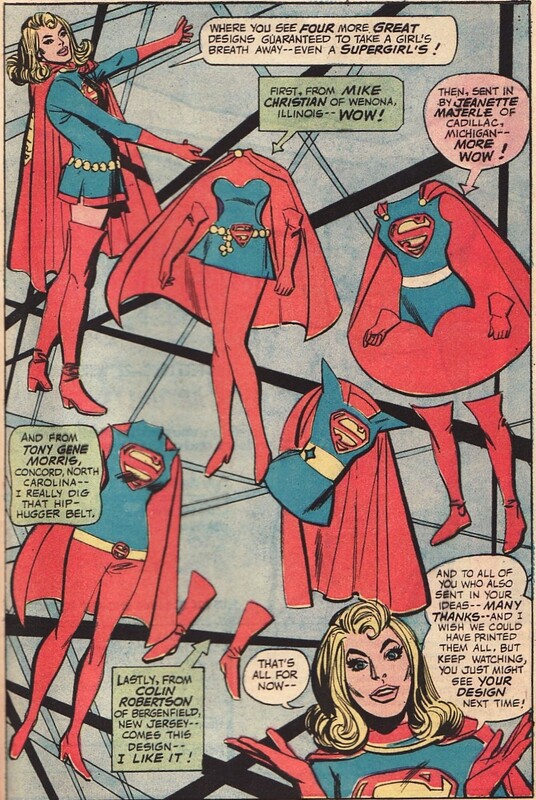 At the end of the second story, Supergirl again thanks everyone who sent in their ideas while sporting the current 'new costume'. A little over a half a year later, DC release Super DC Giant #24, a Supergirl issue reprinting her famous battle with her first arch-villain Lesla Lar. 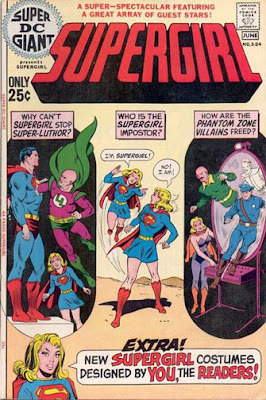 But the cover also has a Sekowsky Supergirl saying that more costumes are on the inside. And again, Supergirl talks to the reader thanking those who sent in costume designs and commenting on some of the specifics including how 'groovy' they are and describing one of them as a 'boy chasing costume'. 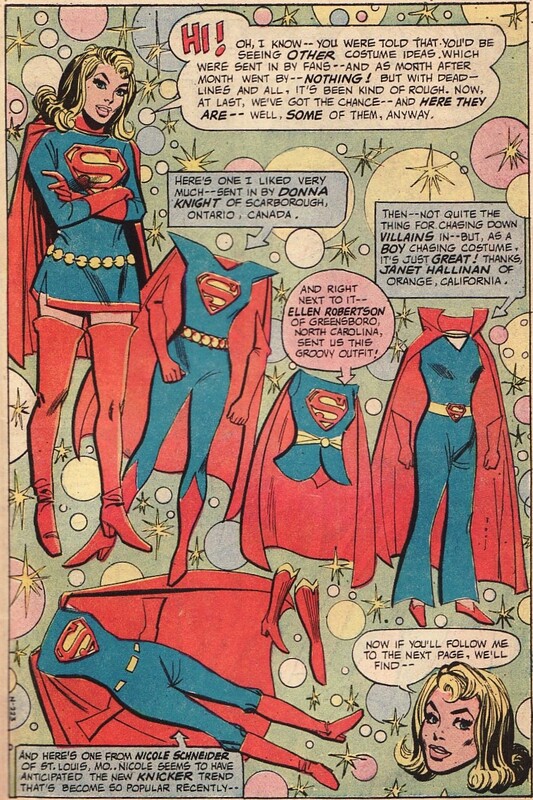 On this page, she likes the top right costume as loungewear. And here she digs the hip hugger belt on the lower left. How great that back then fans could do such a thing and get some page time. I will admit that not many of these costumes grabbed me. Of course I was looking at these through a 90s and 00s lens as I was buying these back issues. Lots of small bits of business to catch up on here, so I thought I would batch them! Over on Jamal Igle's blog, he has announced that he is going to take a look back at his time on Supergirl. 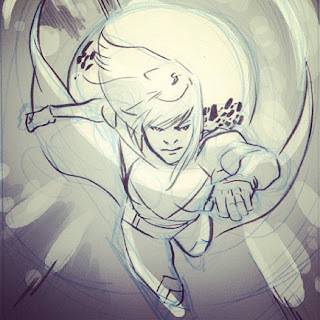 He is going to post 5 pages from his Supergirl issues, including process sketches, etc. He is going to do that for every issue he drew on the title! As a fan of Igle's work and process pieces, I can't wait to look at this series of posts and will probably comment on some of them here. 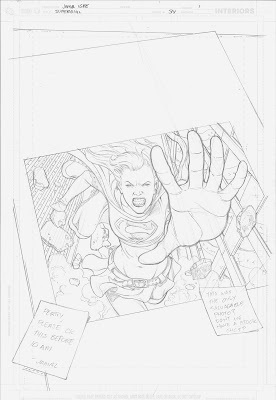 He announced his plans here: http://jamalligle.blogspot.com/2011/11/from-vaults-returns-in.html and included this great pencil page, the opening page of Supergirl #34, his and Sterling Gates' first issue. I was thrilled to see that Jamal will be coming to Boston for the Boston Comic-Con in April. I can't wait to talk to him again. As I said before, as a comic book fan, I love process pieces so any time an artist let's me see that creative side of things, I am thrilled. Asrar usually then will post the more tightly penciled and ultimately the inked/marked final product. I hope he continues to do this. I was all full of hubris figuring I would be able to name the artists immediately but it is trickier than I thought. Maybe some of you out there will have a better time. Make sure to submit your guesses over at CBR! Superman #3 came out last week, the latest chapter of the new Superman 'current' continuity. Unlike the '8 years ago' storyline unfolding in Action, this is the Superman in the now, an established hero with everything that comes with that. It is interesting therefore, that writer George Perez is starting off this new chapter in Superman history with an arc about how people distrust the Man of Steel. 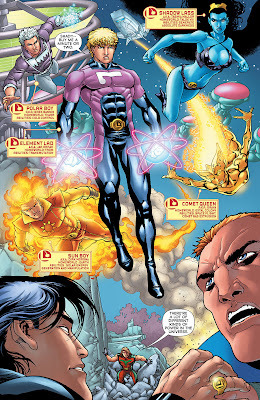 That is already being played out in Action and has just been examined back in 'Grounded' in the old DCU. While this isn't exactly the story line I would have chosen either to reinvigorate the Superman mythos or bring in new readers, I will commend Perez on writing the more dense comics on the market right now. There is no decompression here. Instead we have a lot of story, a lot of dialogue, a lot of mystery. And that makes me happy as a reader. I feel as if this is a comic where money is well spent. This issue also marks the first issue with Nicola Scott on as art. Scott seems to be aping the prior issues by Merino, or is following Perez's layouts closely as this has the same feel as the first two issues. That isn't a left-handed compliment. The book is beautiful and I like when there isn't a jarring change in art styles in one arc. 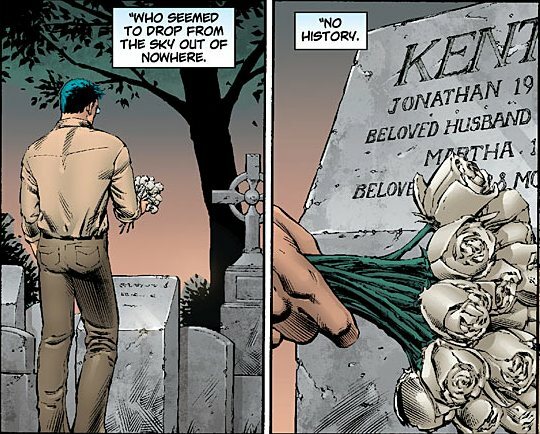 One thing that has not been clearly defined yet in this new DCnU, is Superman's relationship to the Kents. All along I have said that it was the Kents that made Clark Superman. It was their upbringing that made him who he is. We know they aren't alive in this new universe. 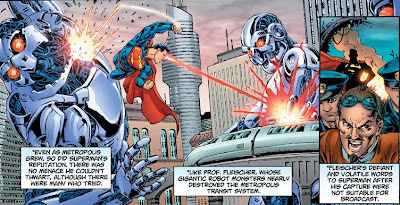 And we know that their lack of presence makes Superman 'edgier' in Action. But my hope was that Morrison or DC in general weren't going to downplay their impact on Clark. 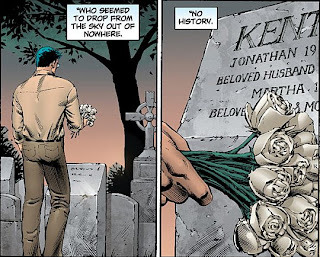 So this opening scene, with Clark visiting his parents' grave (all as we hear reporter Billy McCoy talking about Superman's mysterious past and lack of history) made me happy. But we then are brought to the PGN war room where McCoy is trying to convince the staff to produce a piece discussing the dangers of Superman to Metropolis. 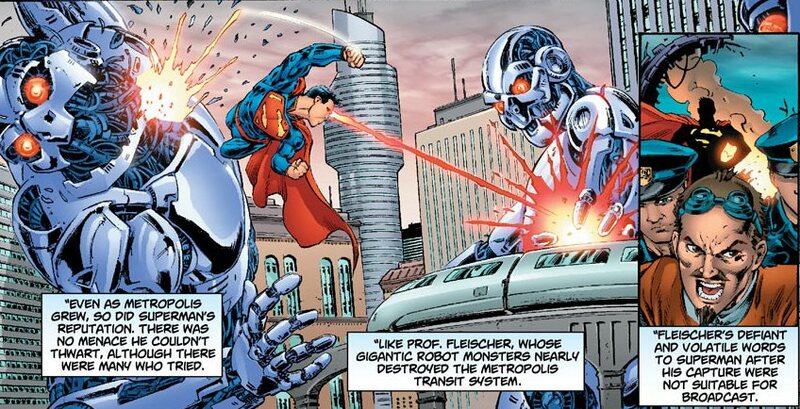 His conclusion is clear, villains come to Metropolis to make a name for themselves by defeating Superman. And the collateral damage is not worth the price. I did like this panel where we see 'Professor Fleischer' and his giant robots. It has to be an homage to the Fleischer studios cartoons and their first episode 'The Mad Scientist'. McCoy continues that the deaths from these super-villain attacks are Superman's fault. 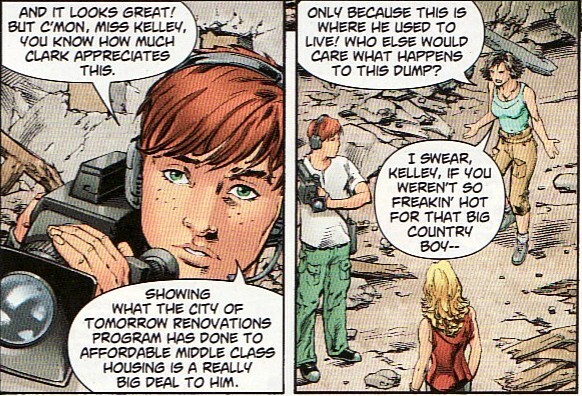 Despite the good that Superman has done (including a quick recap of the events seen so far in Action Comics), McCoy thinks the cost of life is too high. You only see a snippet of the panel with the face pictures of the dead, a nice panel driving home the point. 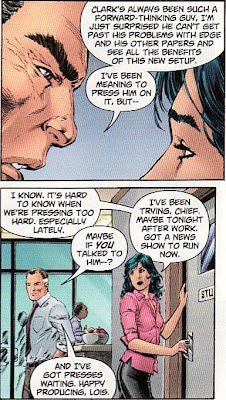 But I did like that the other PGN staff, especially Lois, defend Superman. I am glad that the cynicism against heroes hasn't completely invaded the DCnU. The latest victims of Superman are the homeless person and security guard 'possessed' by the fire demon and invisible alien from the first two issues. Lois and Perry are hoping that Clark might recognize the homeless man (seen walking with the security guard out of the hospital where the guard was being held). 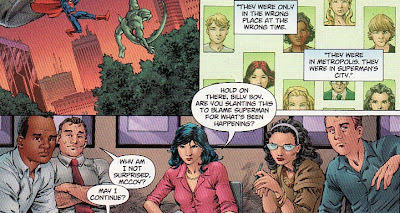 Lois and Perry both know that something is wrong with Clark and I liked that Perez writes a short but thick scene where the two talk about their worries about their friend. Is it simply that the Planet has linked with GBS? Is it more than that? At the very least, this shows the depth of these relationships, something not spelled out quite yet in the DCnU. In the meantime, Clark streaks back to Metropolis because he is late for a piece he is shooting with Heather Kelley about the destruction of some low income housing. Kelley has romantic feelings for Clark and is trying to find a way inside. 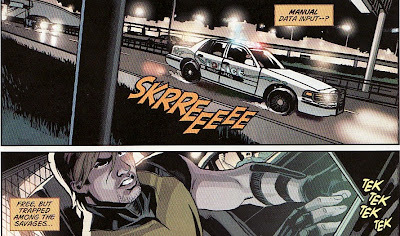 In some ways, I thought this was the most interesting part of the issue. A new character with romantic feelings for Clark? While it might be cliche, I think it would feel fresh to see how Clark would react to this, especially given his unrequited feelings for Lois. We haven't seen a different love interest in Superman books in a long time. 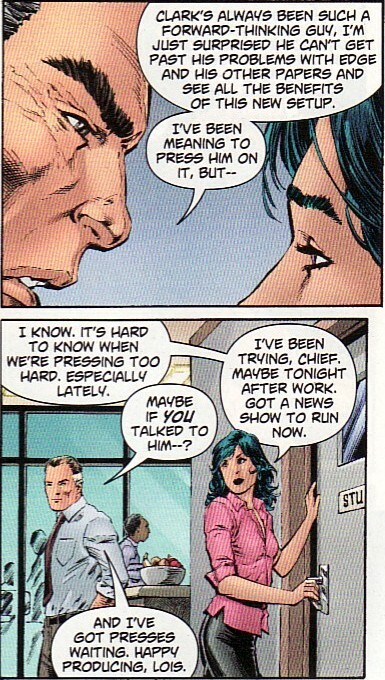 While I miss the Clark/Lois marriage, this could have been interesting to watch play out. I don't know if we will see it. 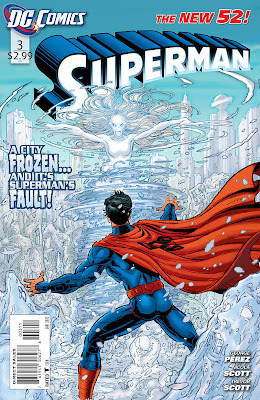 At Kelley's site, just as Superman arrives in the town, an ice entity erupts freezing everything around it. And it's voice, while spouting alien gibberish, is Heather's. She has been 'possessed'. 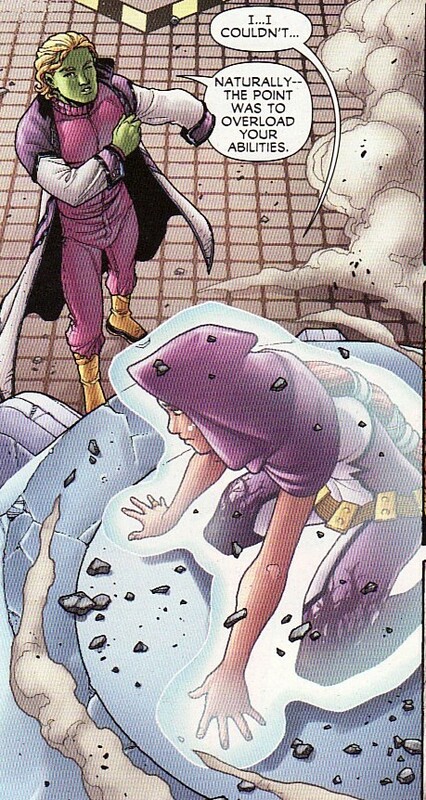 And her powers are immense, not just freezing the people in her wake but actually turning them to ice! Again, it is a vestige of the older universe but I love that with a major chunk of the city frozen, with countless citizens turned to ice, Superman still checks up on Lois individually. Heather is actually at the base of a winter tornado which is topped with the ice woman. So she isn't exactly the demon ... maybe just channeling her? Anchoring her to this reality? Whatever she is, she says Krypton just like the prior aliens who have attacked the city. 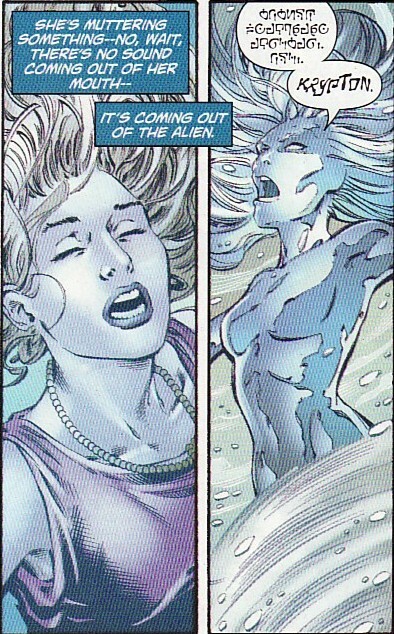 Without any better idea, Superman decides to sever to connection between Heather and the ice woman with heat vision. You know what I loved here? 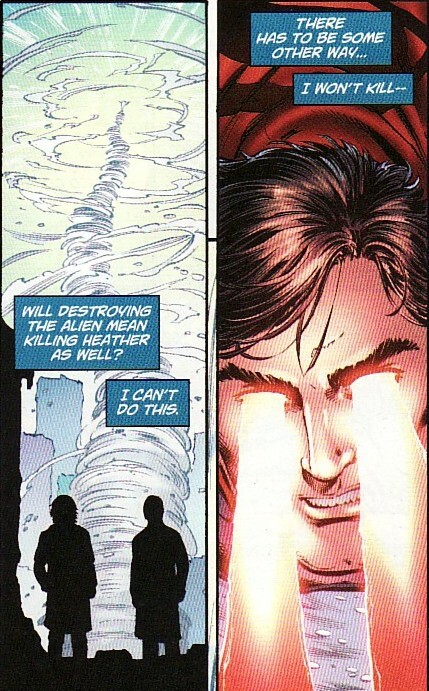 Superman saying he won't kill. Wonderful. The tactic works. And with the connection severed, everything goes back to normal. The ice disappears. The people become people again. None of the destruction seemed to have happened ... the same as with the fire demon from issue one. That is perplexing. But even with the ice demon gone, Kelley remains possessed. And now she has joined up with the other humans effected like her. And now they aren't just saying 'Krypton'; they are saying 'Clark Kent'. So I am intrigued by this alien storyline. It wonder how all of this will come together, who these things are and why they are attacking Superman. It seems strange that they have such different powers. And why do their efforts disappear when they are repelled? The undercurrent of a gloomy Clark and a distrusting city populace is the part I am not that interested in. Think about the last Superman reboot, the Byrne stuff. Those earliest stories had Superman settling into his new history, meeting and defeating his rogue's gallery, acting heroic and being accepted. I thought the energy in those issues was palpable and Byrne made Superman exciting and meaningful again. I don't know if playing up this element of Superman is the way to go. We are halfway through this arc and I seem to be enjoying it more as it progresses. A lot of good has sprung from my recent blog crossover with the Idol Head of Diabolu Martian Manhunter blog reviewing the DCCP three part story which introduced Mongul to the DCU. It made me realize that I haven't read the early issues of the next rendition of Mongul in the post-Man of Steel John Byrne Superman run. 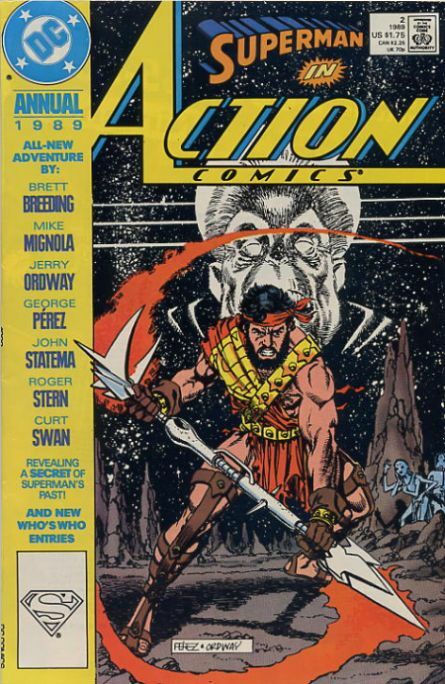 So I started thumbing some of those issues, one of which was Action Comics Annual #2 (1989) which included Mongul, Warworld, the warrior Draaga, and the origin of the Eradicator device. 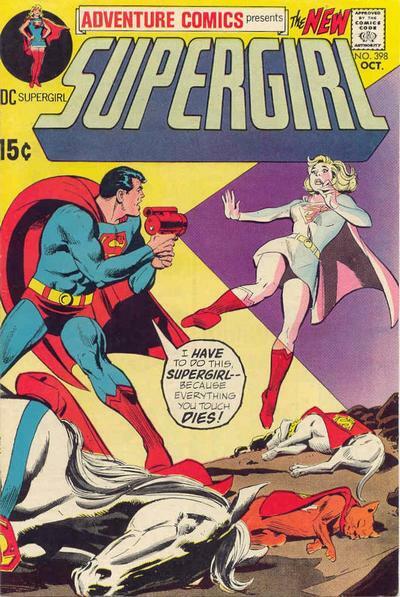 It also had art by George Perez, Curt Swan, and Mike Mignola! 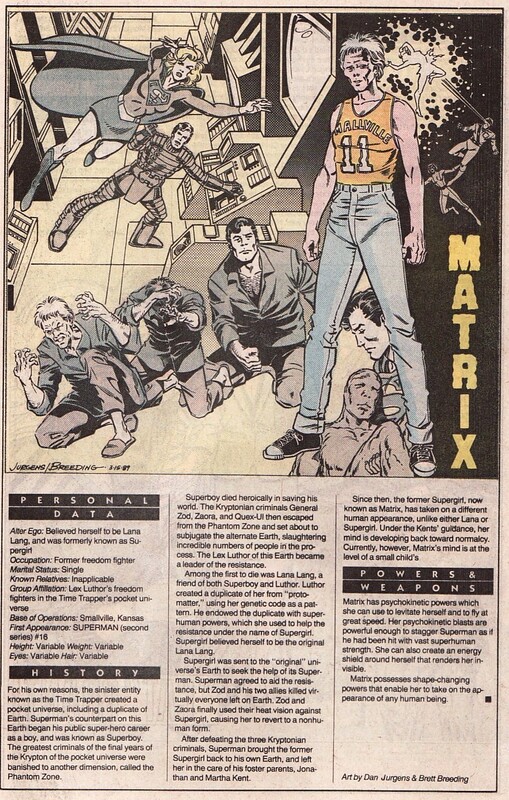 But what I had completely forgotten about this issue was the inclusion of a Matrix Who's Who page. 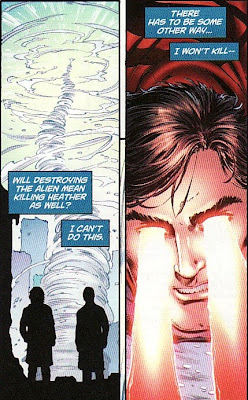 This was in the almost immediate aftermath of the 'pocket universe' storyline were Superman executed the Phantom Zone villains. Superman is off in space atoning. And Matrix is a crushed near-infantile being nursing her wounds at the Kent farm. Shortly after this she 'became' Clark Kent, keeping his secret identity intact while losing her mind. It is an interesting Who's Who page, the mid-point between the 1987 Supergirl Who's Who page and the 1990 'binder size' Supergirl Who's Who page. For Supergirl fans in 1989, this was the closest we would get. 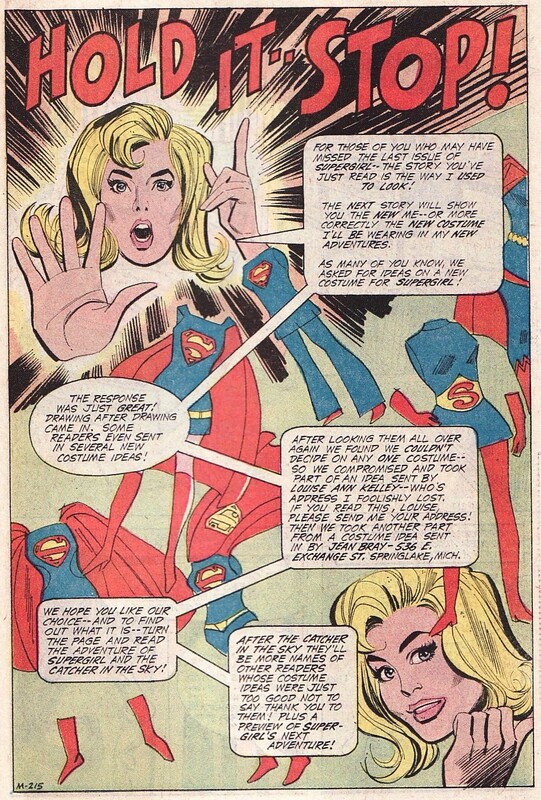 An image of Supergirl is only a small part of this page. This reminded me that Supergirl fans should really be happy about the prominence of the character right now. The art is by Superman big gun Dan Jurgens. 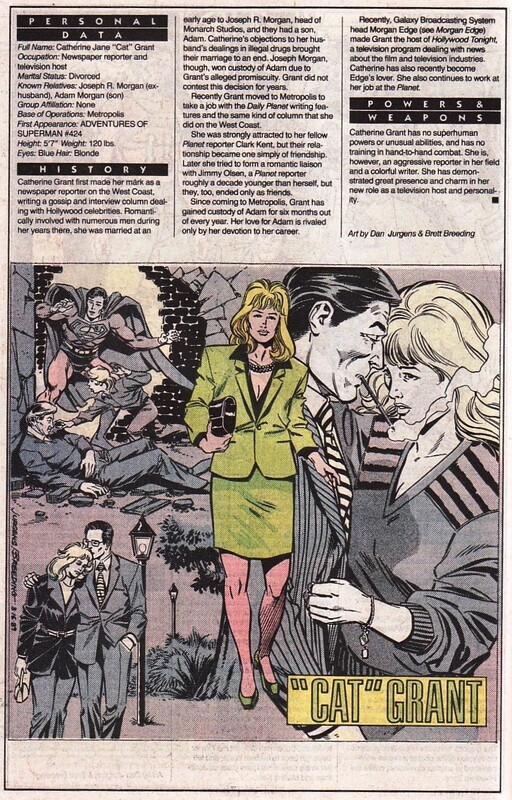 Also in that issue was a Who's Who page for Cat Grant. I include it not only for completeness sake but also because Cat played such a big part of the excellent Gates/Igle years. This is definitely a younger less jaded Cat here. Her son Adam is still alive at this time and she is fighting harassment in the workplace. Here is the distinctive cover of the issue for those looking for it. It played a pretty big part in some upcoming stories of that time period. Mongul, Draaga, and especially the essence of the Eradicator all played big (if not huge) roles in Superman's history of that time. 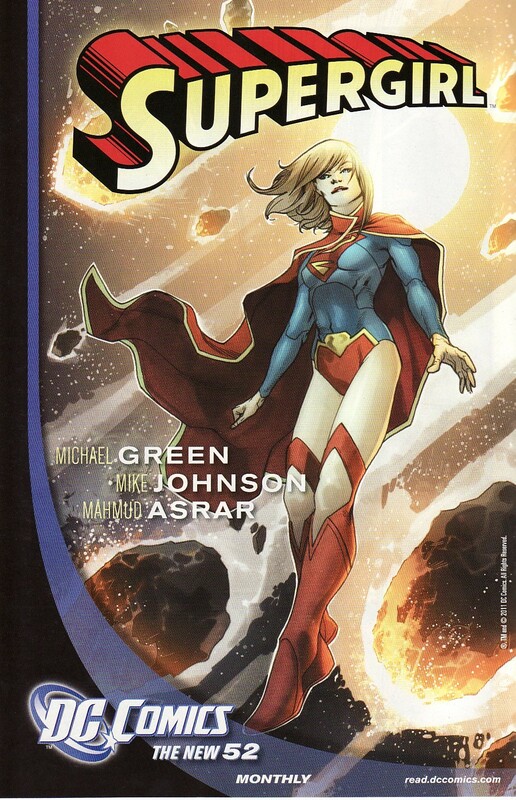 For those interested in prior peeks at Supergirl Who's Who pages here at the Comic Box, here are some links. 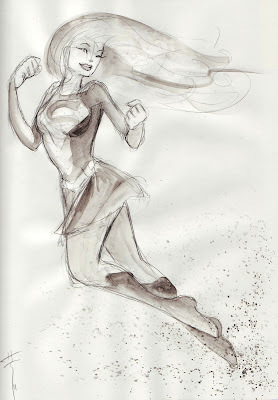 Here is the latest addition to my commission collection, a pencil and inkwash Supergirl from Sara Richard. I got it at the Boston Supermegafest last weekend, a sort of pop-culture smashup convention. It is an interesting mix of B-list, C-list, and D-list celebrities, pin-up models, comic books artists, and dealers. This year's big guests were Patrick Stewart, Sean Astin, and the kid who played the young Boba Fett. It also included the guy who played Boba Fett in the original Star Wars movies, Rex Smith, and a bunch of Deal or No Deal models. It is an annual tradition for me to go with family. My brother is a huge Star Wars guy. I am the comic book guy. And my other brother and brother-in-law tag along for the fun. She has a great style, influenced by Japanese paintings and just eye-grabbing. As a local artist, I have seen here at a bunch of cons and have always meant to grab a piece from her. I didn't expect to see her at the Megafest so when she was there, it seemed like a sign. Knowing the folks I came with weren't in it for the long haul, I opted for the quicker pencil/ink commission as opposed to the full body/color (which I would have got if I had more time to let her finish it). Anyways, it is a great piece with a graceful Supergirl and it highlights Richard's style nicely. 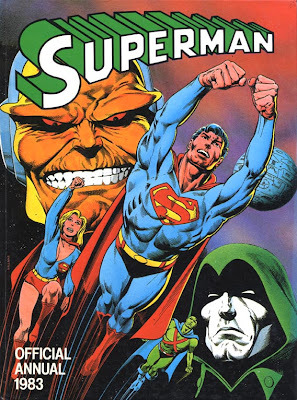 Last month, I was part of a blog crossover with the Idol Head of Diabolu reviewing a three part DC Comic Presents story involving Superman, Supergirl, The Martian Manhunter, The Spectre, and Mongul. It turns out the three issues of DCCP were packaged as an Annual across the pond and it featured this cover by Brian Bolland. Now I am a huge fan of Bolland's work ... a huge fan. And one thing that bugged me was that I never got to see his rendition of Supergirl. That is, until now. 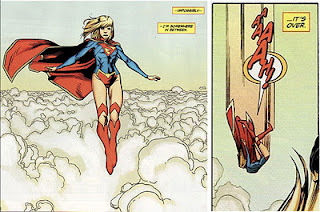 So it certainly isn't his best work, but it is a Bolland Supergirl, in the hot pants costume no less. So just seeing this makes me give thanks. Happy Thanksgiving! Now I love Bolland's interiors on Camelot 3000 and The Killing Joke. And I thought his Animal Man covers were great. 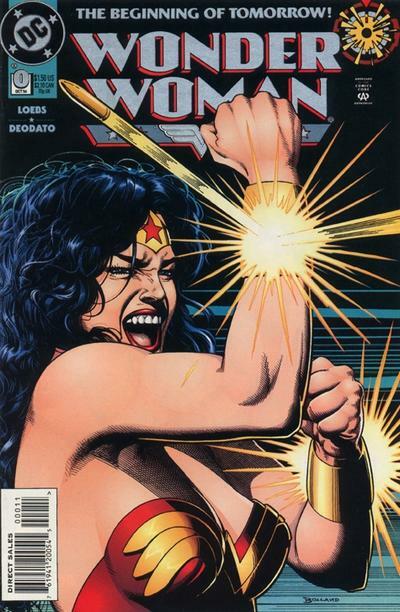 But I think my favorite stuff by him is his Wonder Woman covers from the mid 1990's including this, my favorite cover from that run, Wonder Woman #0. 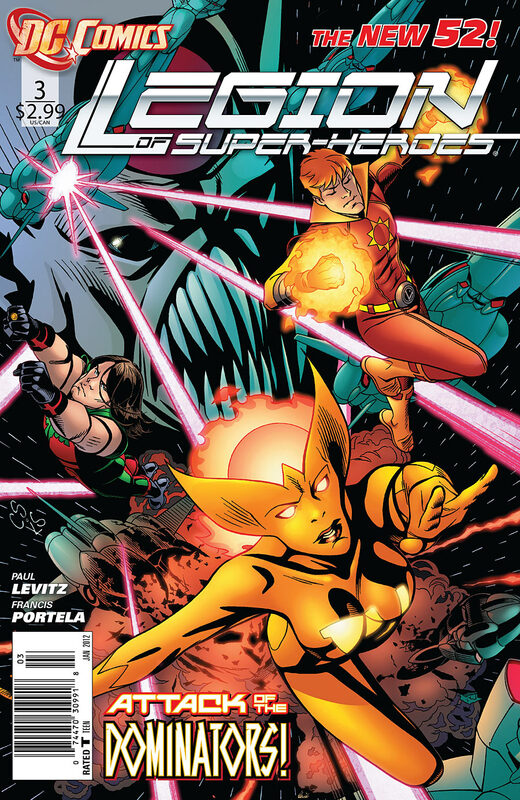 Legion of Super-Heroes #3 was released last week and did a good job of moving the Dominator storyline forward in a hurry while allowing more of the Legionnaires to shine. It has been something of an interesting arc to read from a metatextual point of view. This was the first arc of the DCnU, the jumping on point for new readers, the place for people who have been away from comics to come home to. And yet, this wasn't a reboot. And we are dropped into a pretty continuity heavy story involving new Legionnaires, Daxamites, the Dominion ... and most of it without in depth explanation. Could a new reader pick this book up and understand it? For a lifelong Legion fan like me, this has actually been a fun read. It definitely started slowly but the last two issues have built up some momentum and this one in particular was a wild ride. 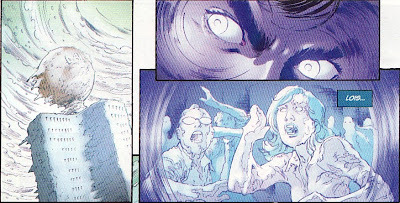 And, as I have said from the beginning, I love Francis Portela's art here. Just lovely stuff. He uses a nice mix of close-ups, distant shots, and points of perspective to add some dynamics to the battles here. Really slick stuff and perfect for this futuristic book. Old Legionnaires artist Chris Sprouse does a good cover here, the specter of the Dominion looming in the background. Last issue the Dominator fleet pulled up to the Panoptes planet. 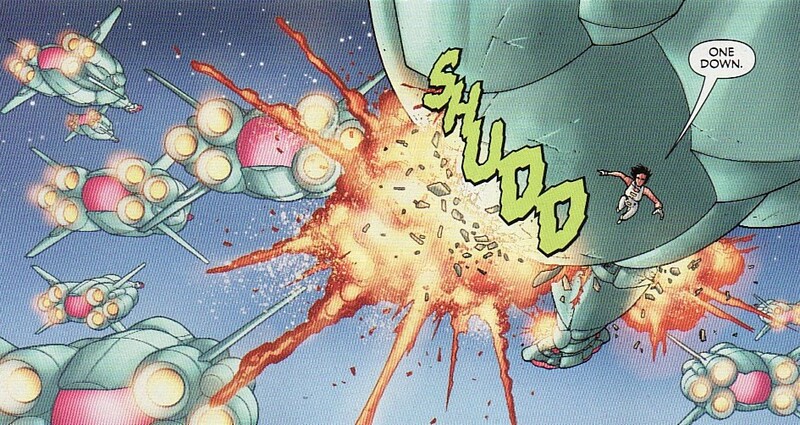 Very quickly they show their belligerent intentions by firing on a dematerialized Phantom Girl. I love the Dominators usual overconfidence when they look at the Legion squad on the ground. No 'dangerous' Legionnaires! That guy is crazy for underestimating any Legionnaires after the years of losing to them. This is another example of the interesting art Portela is using, showing us the team as images on a panel this Dominator is looking into. Even the change in size of the subjects, the huge nature of the Dominator towering over the Legion images adds to the power of his line. As always, when art and words mesh together, comics are at their best. Back on Earth, despite the craziness happening at the rim of the galaxy, Brainiac 5 continues to experiment with the mystic shielding of Glorith. Brainy basically finds the limits of her shielding (she is still protected by his force field belt) and hopes to then isolate some of the time stream properties he has seen there. Is there any doubt she is going to become 'Glorith, the Time Trapper'? Is there any doubt she is the 'hooded woman' of the DCnU? And if Brainy nudges her in that direction, he will have been responsible for her and Computo! As for those 'not dangerous' Legionnaires. Phantom Girl knows just the parts of the Dominator engine coils to ethereally pull to overheat them. Great sequence here with closeups of Tinya's hand and face just prior to this wide shot of her flying in space amidst the explosions. Phnatom Girl has really been a star of the Legion books since Levitz returned to the book, portrayed as fun, smart, and strong. 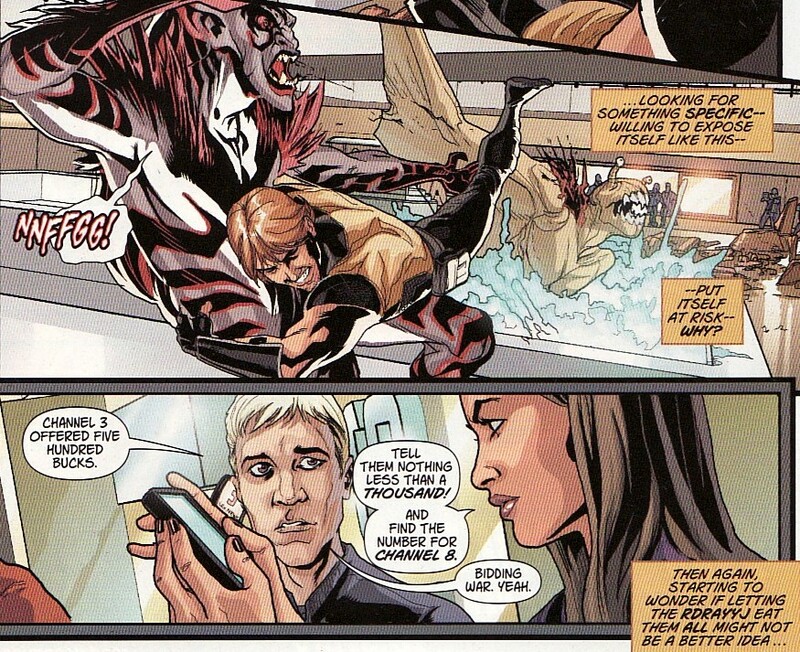 Only last issue's slip up of going to Jo and Res-Vir hears her has seemed off. One of the best things about the Legion book has always been the size of its roster. Levitz has always been able to keep all the characters active and involved, keeping each one individual and well rounded. While the main team and Mon-El fight on Panoptes, a second team heads to Daxam to see just how Res-Vir (the Renegade) has got off the planet despite the race's weakness to lead. The planet's leaders seem peaceful enough and welcome the team. But they learn that they don't know how Res-Vir has left. Could his 'offworld virtual' teachers actually been the Dominators, using propaganda or mind control to make him their agent? This was just a nice splash page. I love Ultra Boy in the background. And just like that, the now more fortified Legion force lays into the Dominator fleet, destroying/disabling ship after ship. We still get some characterization in the process. Here Dragonwind seems to be making a pass at the all too ready to get busy Sun Boy. The confidence dripping off his face is great, as if he is simply used to having women approach him like this. But it also gives us a look into Dragonwind too. She seems to be a passionate and very emotional person. We even get to see Polar Boy using his brains and powers to take care of a ship himself. But this was my favorite scene in the battle. 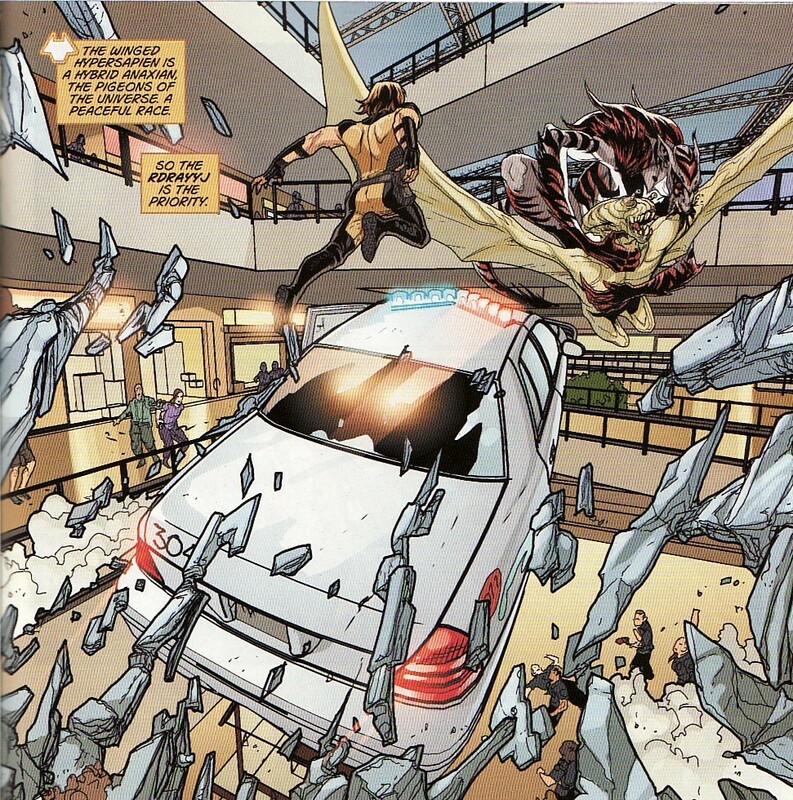 In the chaos, Cham has assumed Dominator shape and slipped on board a ship. With the fleet retreating before the Legion attack, he is going to follow this attack to its source. That is just great Cham characterization, perfect for the leader of Espionage squad. 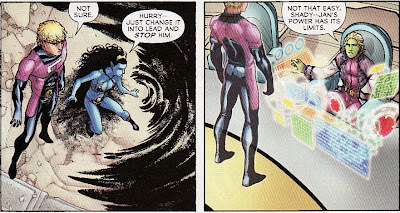 As for Res-Vir, he and Mon-El continue to fight, this time inside a darkness cloud of Shady's all while Brainiac and Element Lad figure out how to transmute or nullify the anti-lead sera inside Res-Vir. It will be tricky as changing minute elements within a body is delicate work. The wrong amount could kill the Renegade. Shady seems to have some sort of physical response to the shadow she has created. I don't know if it is the depth of the darkness, or the fact that so much action is happening within, or the volume. But she can't maintain it for long, collapsing at the end. I have never seen the blackness sap her like this so this felt new. I did like the way the darkness is represented at the fringes, almost like crayon strokes. Luckily Jan doesn't have to try any microscopic alchemy as when the shadow is dropped, Mon-El is shown to have simply overwhelmed the Renegade. 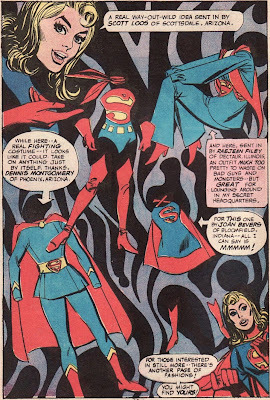 The book ends with a sort of sit-com end joke, Mon-El joking who he is used to action in the shadows (having dated Shadow Lass for a long time). There is no cliffhanger here as the team has won the battle although I am sure there is more fallout next issue. So I didn't mind the cheesy punch line. Overall, not a bad issue as this truly felt like Levitz hitting his stride. We had action, character progression, and multiple squads on multiple sites. That sounds like a Legion book. 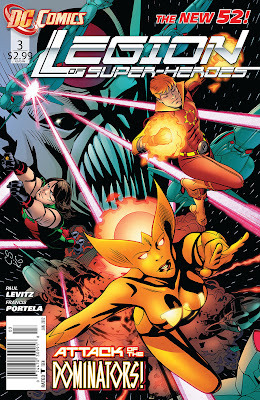 Add to that Portela's art, and this was another great third issue for a DCnU series. There certainly was a major publicity push for the DCnU throughout media both mainstream and more comic-centric alike. And one of the things that I have been impressed with has been how the mainstream media has remained plugged in. The Source continues to post multiple links where DC books are previewed or creators interviewed. But another thing DC has done is maintain internal publicity, pushing their own books in the pages of other books. While the company is doing a great job pushing most of its books, I have been very happy with the amount of time Supergirl has spent in the spotlight. The page above, a cropping of the cover of Supergirl #1 has been a splash page ad running in some of the DC books this month. And I have enjoyed the short interviews with creators that DC has been putting in the back of the books as well. I certainly didn't buy all of the new 52 and haven't really sampled any new books since I settled on my latest pull list of monthlys (Supergirl, Action, Superman, Superboy, Legion, Legion Lost, Animal Man, Batwoman, Birds of Prey, Demon Knights, Green Lantern, Hawk and Dove, JLA, JL Dark, Wonder Woman). That is certainly more than I expected to settle on. But these interviews have allowed me to hear more about the books I'm not picking up. 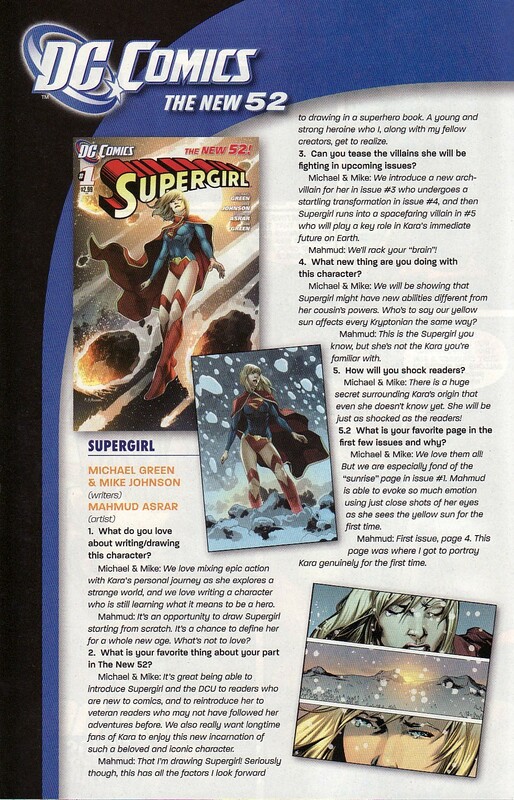 Here is the Supergirl page with a brief Q&A session with writers Michael Green and Mike Johnson as well as artist Mahmud Asrar. It is well worth reading although there isn't a lot of new information here for those of us who have read every interview and quote these guys have said about the book. But there were a couple quotes that stuck out. 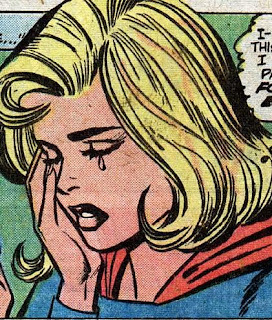 Green and Johnson said that they are excited to (re)introduce Supergirl to new readers but they "also really want long time fans of Kara to enjoy this new incarnation of such a beloved and iconic character." As a long time fan that is reassuring to me. At the very least it means they recognize what has worked in the past, what has made Supergirl fans become fans of Supergirl, and therefore don't want to necessarily complete recreate her. I am all for bringing in new Supergirl fans. I have always wanted her to be more popular. But I think her core needs to remain solid. 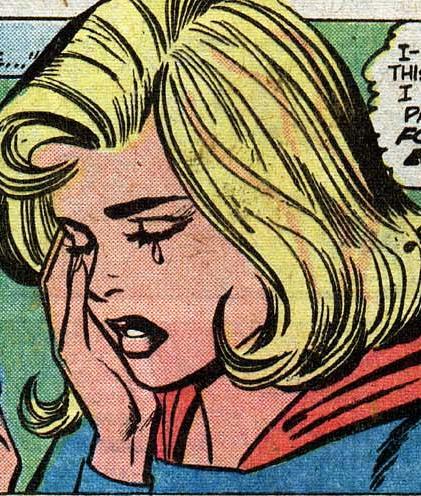 Asrar says something similar saying "This is the Supergirl you know but she's not the Kara you are familiar with." Anyways, Supergirl has to be considered a hit coming out of the DCnU and this sort of publicity can only help keep her near the top where she belongs. And the creative team continues to say more and more that makes me think that the book will have a Supergirl I like. Legion Lost #3 came out 2 weeks ago making this a late review. We are three months into the DCnU and it is funny how my responses to some books have changed since the opening issue. 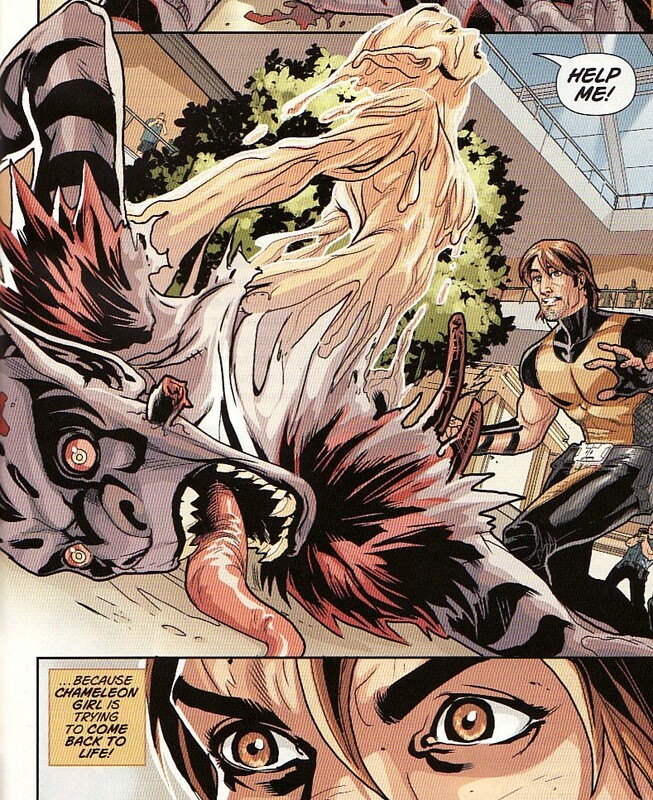 I really didn't like the first issue of Legion Lost. I put the book on life support saying it had a short period of time to grab me. I thought the second issue was better with a nice narration by Wildfire and smoother art by Pete Woods.I still wasn't fond of the idea of the stranded Legion fighting a plague in the past. But it was a nice improvement. 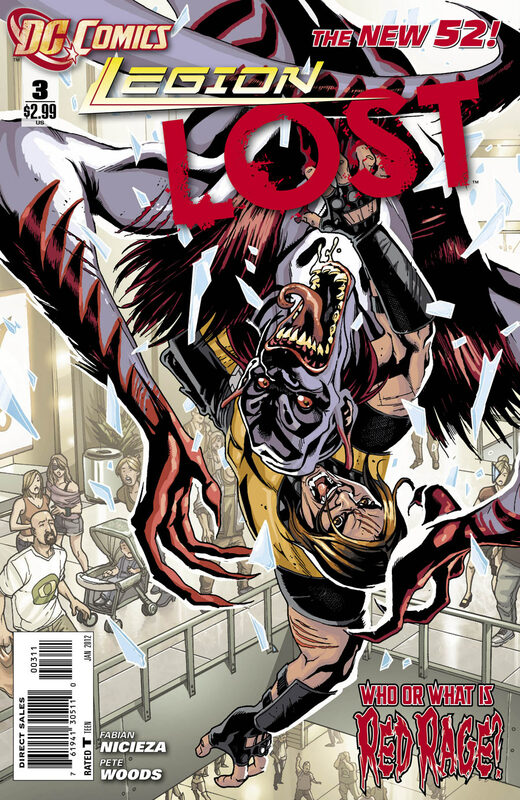 Legion Lost #3 was an improvement on the last issue. That's three straight months of improvement and as a result a growing confidence in this title. 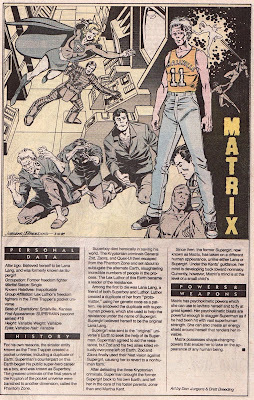 First off, Fabian Nicieza is really making the Legionnaires three dimensional. Last month's narrator was Wildfire. This month's is Timber Wolf. And that method of spotlighting the inner thoughts of the team members is a great way of adding depth to these characters. I hope that this is a theme, that each month we'll get a new narrator and thus see this story truly from multiple perspectives. And Pete Woods art is at its strongest here, really getting into the action of the book. Now I will say that I still don't think this overall plot of the hypersapien plague can be sustained long term. So the overall story is for me the weakest part of the book while the individual chapters have been fine. In a nice opening sequence, we get a quick overview of the story and some glimpses of future plot lines through the eyes of a telepathically scanning Tellus'. More and more people are being infected. An alien like being is hunting and eating prey. More importantly, a mysterious woman is watching all of this stuff from afar. I doubt she is someone from the CDC. 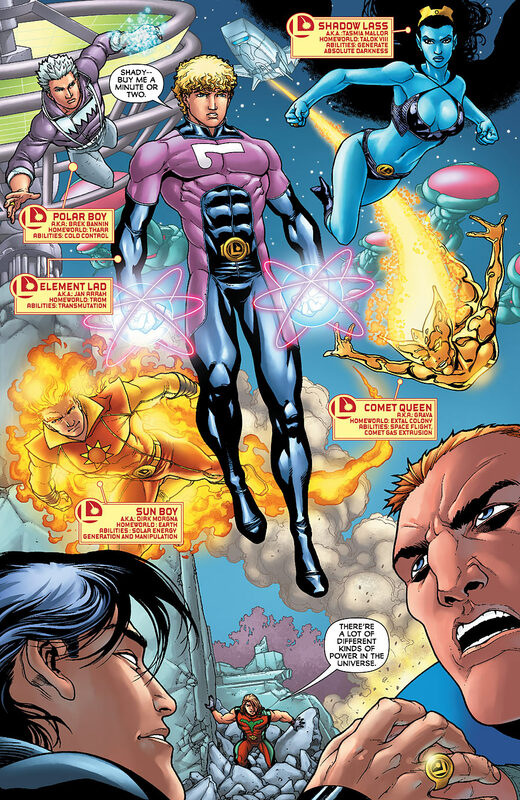 Maybe the new DCU has a Metahuman Center for Disease Control, a MCDC. And why do I think there is definitely a military or offensive wing to whatever group this woman represents. I don't recognize her scars so she must be someone new. But the thing I liked the best about this issue was the inner thoughts of Brin. You can sense how he feels like a caged animal. He is angry. He is frustrated about everything. And hanging out at a Motel 6 isn't helping things. As always, the best part if Timber Wolf is how he tries his best to suppress this animal side of himself and maintain control. It has never been easy. So this just read well. 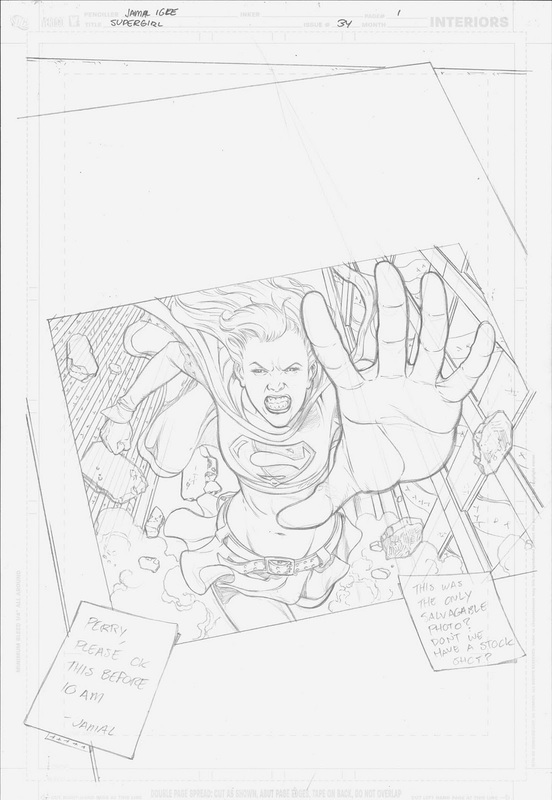 I included this corner of the two page spread just to spotlight Pete Woods' version of the new Supergirl. I have always loved Woods' take on Kara, whether it be in Amazons Attack or New Krypton. Heck, he even made the bottom of the uniform look good. 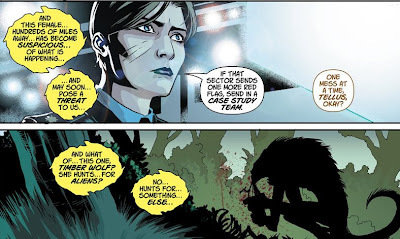 As the 'tech' Legionnaires try to cobble together some sort of time beacon from the wreckage of the Time Bubble, Timber Wolf asks what I would be asking. Shouldn't they be asking Superman for help? The problem is the Legionnaires are probably infected with the virus themselves. To approach Superman would be to expose him. Better they remain in hiding as they try to figure things out and squelch this epidemic. I don't know if I 100% buy that. They could phone him rather than talking in person. Don't you think Superman and the JLA might be helpful in potentially stopping a world-threatening infection? Also, I doubt Wildfire can harbor viruses as an anti-energy being. He could probably talk to Superman without a problem. Unless this reluctance to speak to anyone is more about time paradoxes. 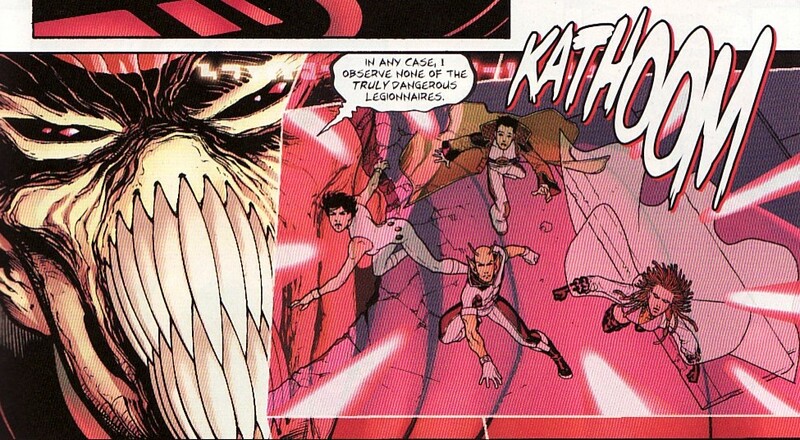 So the Legion stays put trying instead to find the index case Alastor and the doctor from last issue. One of the things I am up in the air about is the characterization of Dawnstar. I like the fact that she demands perfection from herself and others. I also like how the environment of 21st century Earth makes it impossible for her to be perfect. Here she is frustrated with her inability to track Alastor. While that frustration, and seeing the usually reserved Dawnstar unravel a bit, is going to be interesting to watch I wonder worry it will make Dawnstar less impactful in the book. How can a Dawnstar that can't track be useful? And will her only response be frustration? Or will their be some despondent moments? But this is Timber Wolf's book. He decides he can't stay penned in anymore, especially with the monster seen in the above panel on the loose. He heads to the local police station to examine the latest victim of the monster and then hears where the creature is. But here is the dichotomy of Timber Wolf at it's best. Here he says he is trapped among the savages because he needs to hand enter info into the police car's GPS. And yet, a page before, he is licking the half-eaten cadaver of the victim to get information! Who is the savage here? Fantastic juxtaposition! The creature is an Okaaran Rdrayyj and it is attacking another mutated human in the Great Mall of Fargo. 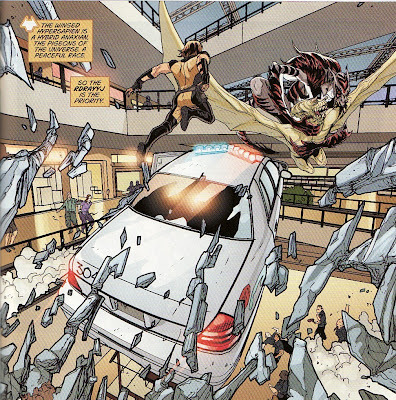 This is my favorite panel of the book, a dramatic action filled panel as Timber Wolf drives his stolen police car into the mall while simultaneously leaping into battle with this thing. The rdrayyj and Wolf begin to fight. But Timber Wolf wonders just what this things is doing. There is easier things to eat so there must be something about the hypertaxis victims it is eating that is unique. As I said, Timber Wolf's struggle with maintaining some humanity and civility is one of my favorite things about the character. Above he called us savages. Here he sees cause for that opinion as two people video tape his fight in hopes of a cash score as opposed to helping or fleeing. Just when I am wondering how a corpse-licking guy can call me a savage, Nicieza shows us why he can. Nice. 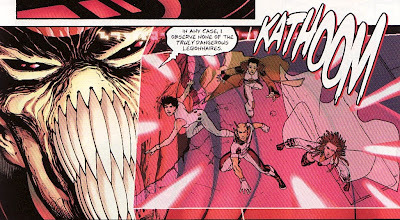 Throughout the first couple of issues, I wondered if the Legion's fight with Alastor exposed them, infected them. Timber Wolf suddenly has the ability to fire his claws like quills.I don't know how I feel about this yet. 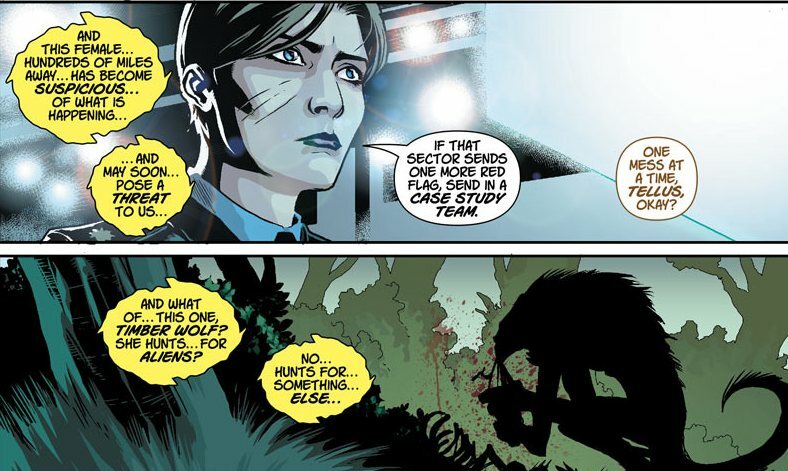 Earlier in the issue, Wolf discovers that all the other victims of the rdrayyj had durlan DNA from the virus and this current victim does too. Somehow Chameleon girl has been trying to 'come back to life'. Was she the rdrayyj? Mutated by the infection? And doesn't that mean she's a killer? Or was she somehow stuck in the rdrayyj? I don't know how Nicieza is going to explain this but I'm glad Yera is still alive. Hopefully Gates returns soon. So this book continues to get better and better. I still don't know just how accessible this book would be for a brand new reader, a Legion novice. But the switching narrator, the characterization, and the action are all working for me now. As I said, the definition of savagery in this issue was a nice them by Nicieza. And Pete Woods is is firing on all cylinders. Let's hope the momentum continues to propel this book forward!